"Rumania, hah! It is neither a state nor a nation, but a profession." The floods came early to western Rumania, spilling in thunderous green torrents from the snowy Carpathians, slashing roads to ribbons and turning towns into archipelagoes. Food was short, drinking water unsafe. It was a time when people looked to their government for action, and the Communist regime of Rumania was quick to respond. Fully half the citizens of Oradea, a city of 110,000 hard by the Hungarian border, were lining the streets when the train from Bucharest chuffed to a halt. Through feathers of steam and shrill cries of "Sa traiasca!" (Long life!) stepped a short, square-shouldered man wearing a blue nylon raincoat and a quizzical expression. Within minutes, Nicolae Ceausescu, 48, leader of Rumania's Communist Party and the youngest Red ruler in Eastern Europe, had changed into his "touring outfit" and was ready to roll. Clad in knee-high black boots, a grey wool lumber jacket, well-worn brown corduroys and a visored cap, Ceausescu moved out through the waterlogged countryside, past peasants in dripping sheepskins and gaggles of screeching schoolgirls, past hat-waving horsemen who offered gifts of bread and salt, past thatch-roofed villages painted sky blue and sienna, past, gargantuan collective farms and gleaming new factories. Geese hissed, dogs barked, and Ceausescu listened to gripes. Sometimes speaking from a stack of concrete blocks, sometimes from the back of a wagon, he pressed home again and again message more familiar to Western audiences than to Communists: "We are moving now; we want your help in building a better Rumania." Refuting the Lie. 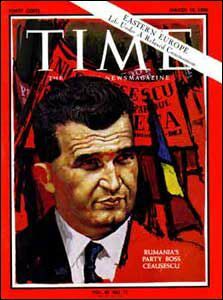 Back home in Bucharest this week, Nicolae Ceausescu (pronounced Chow-shess-coo) quietly celebrated the successful completion of his first full year in power. Under Ceausescu and his predecessor, Gheorghe Gheorghiu-Dej, who died of pneumonia just a year ago, Rumania has utterly disproved two-thirds of Czar Nicholas' caustic caluniny. * Rumania today is indubitably a state, defiantly a nation, and quite proud to admit the Czar's final point about professionalism. Moreover, it was Rumania that in many ways set the pace in the quiet repudiation of the Czar's successors-a chain of events that has subtly altered the nature of European Communism. As a result there are three Communisms in the world today. The virulent Chinese variety would infect the world with "wars of national liberation." The Russian brand has graduated from the minor leagues of guerrilla warfare, and wields vast military and economic power in hopes of winning the world to Marxism through example. The Red states of Eastern Europe have developed a milder, more "relaxed" strain, one better suited to their lack of economic and military muscle. Fragmented by history and welded by ideology, they have arrived at an almost dialectical synthesis of the tensions tearing at them: nationalist, neutralist Communism. Under both Czar and commissar, Russia's aim in Eastern Europe since fm Pan-Slavism of the mid-19th century has been to dilute nationalism and there - by exert its own will over an area do today contains 120 million inhabitants and represents the world's fourth largest industrial complex (after the U.S., Western Europe and Russia). That grip, sow rigidly imposed during Stalin's lifetime has loosened steadily over the past decade as the Communist regimes from the Baltic to the Black Sea have slowly found maneuvering room. Writes Rumanologist George Gross in the current issue of Problems of Communism: "A future Toynbee, looking at the 1960s, may well conclude that the central event of the current decade was the disintegration of the Soviet empire. Soviet hegemony in Eastern Europe is fragmenting, and this process is bound to continue." The Rusting Curtain. The fragments of Russia's dissolving European empire present a rough-edged mosaic to Western eyes, its pieces often inconsistent with one another, all parts undeniably Communist but just as emphatically nationalistic. The 2,000,000 Westerners - tourists and businessmen - who passed through the rusting Iron Curtain last year (a 15% increase over 1964) found themselves transported, as if by time machine, into a Europe that in appearance and manner is almost prewar. Men stalk the narrow, cobbled lanes of Warsaw's "Old Town" clad in anklelength leather overcoats. The taxi fleet of Budapest is made up largely of Russian Pobedas, . whose grillwork and lumpy chassis resemble those of ancient Plymouths. In the faded plush elegance of Bucharest's Athénée Palace Hotel, violins sob Wien, Wien, Nur Du Allein with a sentimentality unmatched since Grand Hotel. More than 300,000 Westerners made Hungary their destination; there they dined on goose liver sautéed in butter at Gundel's, or listened to an Eddy Duchin-like piano at the Pipacs, (pronounced Peapatch) nightclub, whose pianist resembles Peter Lorre. Some 620,000 swarmed into Czechoslovakia, to shop the ancient guild houses of Prague, one of the few cities in Europe untouched by the war, or listen to ragtime at such clubs as the Viola.